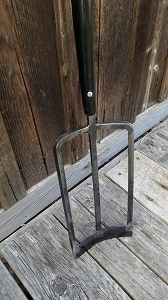 A seeder, a weeder, and a small trowel with a chiseled v-shaped front edge. A seeder, weeder and tight area trowel. Inspired by a Scandinavian tool known as a "Fid", this trowel has a deeply cupped blade that tapers at the end. It is very useful for extracting deep tap roots. The blade has several deep indentations spaced one inch apart. Dump a packet of small seeds into the top of the blade and then tap gently with your finger and the seeds slide down the blade's trough, stalling at the indentations and, thereby, dispensing one or two at a time instead of all at once Beats dispensing seeds from the palm of your sweaty hand. A great trowel for working in crevices and rock gardens. About 14 inches long.